Cherry trees of various kinds are common in gardens and in the countryside, and the rich communities of insects that live on them offer excellent opportunities for research. The authors' own work has already shown how studies of cherry insects can address major ecological questions. As cherries become more popular for planting in amenity areas and woodland, it becomes increasingly important to understand how their insects interact with each other and with the host plant. We hope this book will encourage more people to contribute to this research and to take advantage of the opportunities offered by this very accessible and diverse insect community. 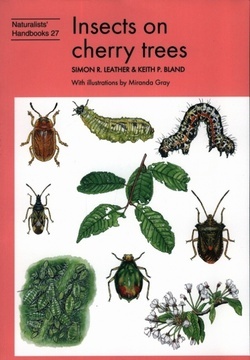 The book introduces the insect species associated with cherry trees, draws attention to particularly interesting features of the insect communities, and highlights topics on which further investigation is needed. Cherries; Island biogeography and species-area studies; Insect-plant interactions; Identification: 10 keys covering the tree species; I Cherries and related species of Prunus; II Major groups of insects; III Adult homopteran bugs; IV Caterpillars of Lepidoptera; V Butterflies and moths; VI Sawfly larvae; VI Adult sawflies; VIII Fly larvae; IV Adult beetles; X Adult heteropteran bugs; Techniques; Some useful addresses; References and further reading. Authors: - Leather, S.R., Bland, K.P.